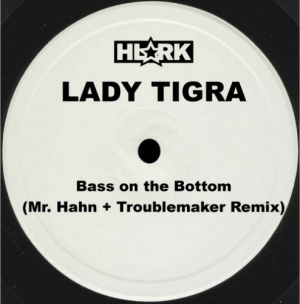 "Bass On The Bottom (Mr. Hahn + Troublemaker Remix)"
In 2006, Lady Tigra signed with High Score Records, relocated to Los Angeles and commenced recording with producer and friend Jacob “Berko” Bercovici. She told eMusician: "It kind of crept up on me; we never intended to have the songs be released. We were just making songs for kicks." The songs eventually became her first solo album, Please Mr. BoomBox. Not only she collaborated with Berko to make this album, but she also jumped in the studio to duet with MC Lyte and gave Mr. Hahn of Linkin Park two tracks to remix. One of Hahn's remixes was "Bass On The Bottom", on which he worked with Troublemaker, who had previously worked on "Rnw@y" on Reanimation. In 2008, Lady Tigra spoke to RapIndustry.com about the song: "It's an evolution of L'Trimm. I'm mostly picking up where we left off. ‘Bass on the Bottom’ is a shout-out to Bunny, and our old stuff. But, there are times when the sound is uniquely me and I like that, too. [...] I'm still deciding which, of three tracks, will be the first single. I did a video for ‘Bass on the Bottom,’ and have been accepting treatments for another track. I really love the ‘Bass on the Bottom’ video, so I'm excited to see if I can top it with the next one." Although the remix wasn't part of the album, it was used as part of a marketing campaign of cell phone company Helio. The campaign consisted of a time-lapse video of a mural created by graffiti artist Stash in the East Village, Manhattan, with the remix as its soundtrack. The installation of the mural was made with help from Kaves of Lordz Of Brooklyn. The second remix created by Joe Hahn remains unreleased. "The original idea of Tigra in the Indian jungle was getting expensive, so I jokingly said that if we didn’t have enough money, the video might end up looking like a Blaxploitation film. We kept going with the joke — The boom in the frame, shots played in reverse, jump cuts, bad splices, coke, ninjas, butterfly knives, bad acting,poorly dubbed lines — you name it. I pitched it to Lady Tigra and she flipped out… Turns out she’s a big Blaxploitation fan like me. We threw in a bit of Foxy Brown, Dolemite, Shaft, and even some random films like Bare Knuckles for their bizarre qualities, tinny sound design elements and general insanity. This video was a blast to shoot. I decided to play the part of the dope pusher 'Cervenka' in the video because I knew I’d be okay in the role and I could guarantee I’d show up… which — even thought this was my first video — I know isn’t something you can count on in the crazy world of music videos." I hope you all enjoy it. Breakdancing ninjas. I thought people might like that. I do." Cinematographer Andrew Sachs added on Vimeo, "The video was directed by John Stalberg Jr. and shot on 16mm film. We added grain and scratches in post-production as the modern 16mm film was too "clean" for the desired look." I'm the Lady Tigra, baby don't you know? The Lady Tigra Is Back with a BOOM! IN DEPTH: Lady Tigra "Bass On The Bottom"
This page was last edited on 22 December 2017, at 14:37.